To me it is. Last week when Hubby wasn't home I ate well. I did not have dessert any day that week. I stuck to fruits and veggies. I did eat small snacks during the day but nothing big. Hubby was home for dinner on Sunday and we had steak, baked potato, steamed veggies, etc. That was all good. Later though we had a big cookie and an ice cream cone. I went to bed and thought I slept good but when I woke up I felt drugged, like I had taken a sleeping pill. Last night I didn't have anything and felt fine this morning. Today at school though I overdid the Twizzlers. I even had some more on the way home. By the time it came to dinner I had no control. I was hungry and really did not care what I ate. I didn't do too bad some chicken and rice and a little bit of macaroni salad. And two more cookies. It's like I had no control. It dawned on me it's just like when I drink. When I drink I don't get drunk anymore but I do have lower resistance. I tend to make poor choices and eat more than I should. 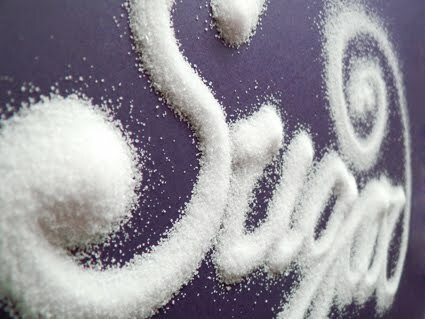 That's exactly how I feel when I consume sugar. Weird huh? So, to me at least, sugar is a drug. And I gave up drugs years ago.